Editor’s note: This article was adapted, with permission, from the February issue of The Elliott Wave Financial Forecast, a publication of Elliott Wave International. All data is as of Jan. 30, 2015. Click here to read the complete version of the article, including specific near-term forecasts, for free. The “Currency War” we discussed in our October issue of The Elliott Wave Financial Forecast and again in the January issue has expanded to new fronts, as world central banks fought to remain economically competitive by trying to push down the value of their currencies. Singapore became at least the ninth nation to “jump on the easing bandwagon” in January, employing loose monetary measures designed to reduce the value of the Singapore dollar. Our long term bullish forecast for the U.S. dollar remains on track, and this month the Dollar Index jumped to 95.527, retracing 50% of its decline from 121.020 in July 2011 to 70.700 in March 2008. Some chart labels have been redacted to preserve value for EWI’s paying subscribers. To get access to the fully labeled chart, click here. Short term, the rally is stretched like a taut piece of rope: Prices have closed higher for 30 out of the past 39 weeks. Recently, a 10-day average of a poll of currency traders (courtesy trade-futures.com) showed 93.7% dollar bulls, an all-time record high. 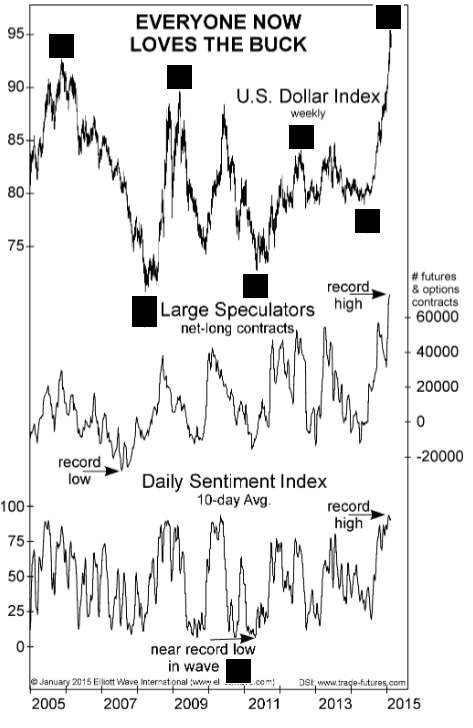 Also, Large Speculators in futures and options, who are generally trend-followers, now hold an all-time record net-long position of 72,897 contracts, as shown on the above chart. The extreme in these measures shows the strength of the rally but also reflects a trend that is ripe for a correction. Click here to continue reading the complete version of the article as part of a lengthy excerpt from the newest issue — including specific market forecasts, fully labeled charts and more — 100% free. This article was syndicated by Elliott Wave International and was originally published under the headline The Currency War Has Expanded to New Fronts. EWI is the world’s largest market forecasting firm. Its staff of full-time analysts led by Chartered Market Technician Robert Prechter provides 24-hour-a-day market analysis to institutional and private investors around the world.